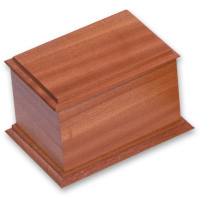 Flat sided solid utile ashes casket. Exterior dimensions (in cm) 20.5W x 28.5L x 18H. Access via base of casket.